It's time for Christmas Cookies, again. I attempted to bake cookies for each of the 12 days of Christmas in the past and it was such a huge undertaking, I didn't get past Day 8. I could have simplified the task, but if you've ever met me, followed me on Twitter or have ever read a post on this blog, you know I don't do anything halfway. In late November, I attended Mixed once again, to experience all of the fun and goodies that I did last year. This time around, I really did have the time of my life. I had more fun this time than last year. Last year, I was coming off my trip to Paris, Competition Dining Final Fire and I wasn't in much of a party mood. I was, however, in meet & greet mode and I mat some amazing local bloggers and new friends! MAN, I love food blogger's conferences. This year, McCormick was a platinum sponsor. They went over and beyond to make sure all attendees had a great time and had product to take home. We participated in demos and creating things with Karen Tack and Alan Richardson of Hello, Cupcake! Learning the "sugar shake" from Alan. It was a life-altering experience that had nothing to do with shaking the sugar my mama gave me. 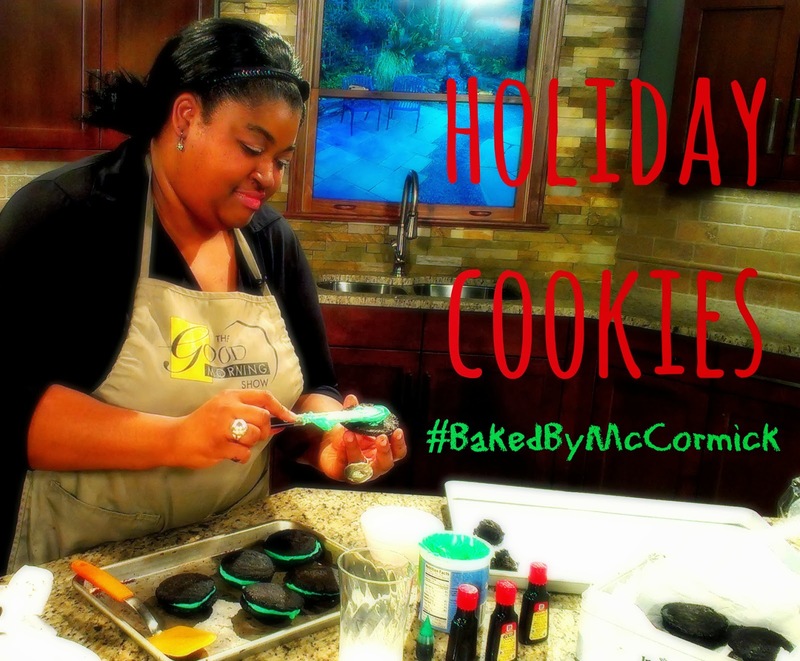 I was asked to appear on WFMY-2 once again and I decided to use my new goodies and knowledge to share a recipe for cookies that people can put in tins for cookie swap purposes. I love this recipe because you can add any combination of flavors and colors to create the perfect cookies for sharing. In the bowl of an electric mixer fitted with the paddle attachment, cream sugar and butter until light and fluffy, about 2 minutes. Add 1 egg, 1 Tablespoon extract; beat to combine. With mixer on low speed, gradually add the flour mixture; continue beating until dough is well combined. NOTE: To create colored and flavored icing for filling your cookies, simply add 25 drops of color to a 16oz. jar of vanilla frosting and 1/4tsp or more of flavoring. What a great post! Your cookies are beautiful. I loved Mixed this year and can't wait to bake up something with my McCormick loot! I love these cookies! Mixed was so much fun too!